Shakespeare Week 2017, due to run from 20th to 26th March, has confirmed a musical theme for next year’s week-long event. Shakespeare Week is a free programme that aims to engage children with William Shakespeare and his work. The 2017 annual national schools celebration will see a number of new resources created for Key Stage 1 and 2 pupils. Teachers can use Shakespeare Week activities and resources to support subjects including History, English, and in this case, Music. What’s happening during Shakespeare Week 2017? The Passport to Shakespeare – a booklet that encourages children to further their relationship with Shakespeare beyond the classroom – is going online. Children will have access to a free digital passport containing activities and challenges to complete outside the classroom for a chance to earn special digital badges. It’s been designed by children’s author Marcia Williams. Williams will also be reading The Tempest in five instalments during Shakespeare Week. Every day, classes can tune in online to follow the story of Prospero, the wronged Duke of Milan and find out how he eventually reconciles with the brother who ousted him. 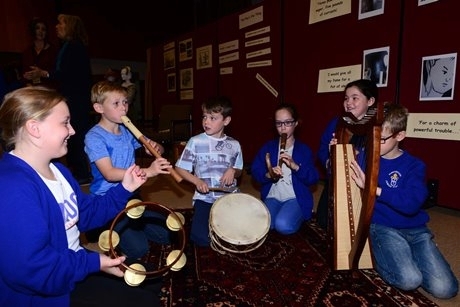 The Shakespeare Birthplace Trust is collaborating with Musicline School Musicals to create a number of new resources to support next year’s theme. Furthermore, teachers will have access to over 150 free resources across every curriculum subject in Key Stages 1 and 2. Shakespeare Week was established by the Shakespeare Birthplace Trust in 2014 as a way to share and celebrate Shakespeare’s creative legacy with every Primary school child in the country. This year saw more than 1.9 million children in 12,000 Primary schools across the UK take part in Shakespeare Week. 2017’s celebrations will see Julian Lloyd Webber, musician and current principal of Birmingham Conservatoire, join the celebrations as a patron of Shakespeare Week 2017. For more information visit www.shakespeare.org.uk.